Mac and cheese has got to be a top ten comfort food. I’ve made all sorts of different kinds of mac and cheese in my lifetime, and granted that it is summer time here in Wisconsin that did not stop me from making another delicious batch of mac and cheese. This time it was ham and peas mac and cheese. Ham and peas are a perfect match, and as I was digging through my freezer to purge things that I have stored for the past couple of months, I decided it was the ham that was going to get purged. 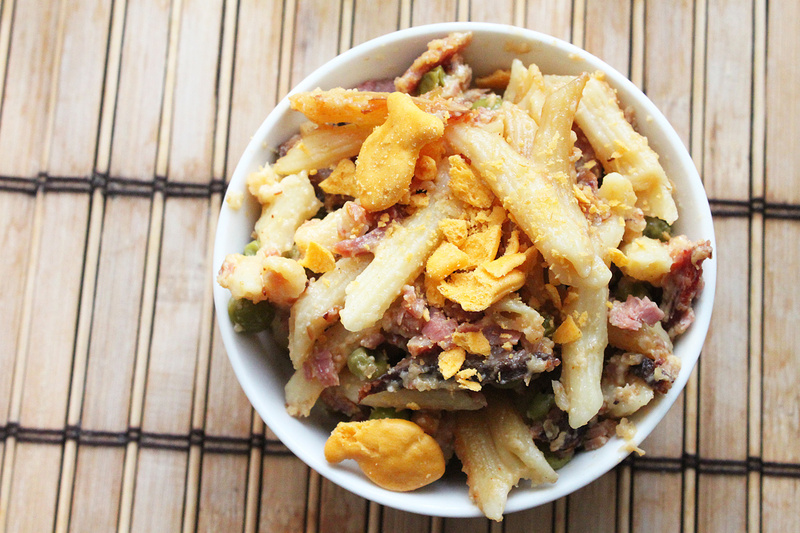 This ham and peas mac and cheese is not only a great pairing, but it ended up being one great one pot meal. Start by adding the canola oil to a large pot, and cook on medium heat for a minute or so. Toss in the onion, garlic, salt, pepper, paprika, Tabasco, and cooked ham. Cook until the ham gets a bit crisp, and the onions cook through, about 7 minutes. During that time, cook your pasta. In a sauce pot, add the butter, and let it get melted on medium heat. Once melted, add the flour, and using a whisk or wooden spoon, cook the flour for a few minutes. Once the flour is a bit golden in color, this is when you want to add in your milk, continuing to stir, mixing in the roux and thickening it. Once the sauce thickens, add in the cheeses and let that melt, making the cheese sauce. Drain the pasta, and add it to your ham mixture. Add in the cheese sauce, along with the frozen peas, and give it a great stir. Once everything is nicely incorporated, cover, and place into a preheated 350 degree oven for 30 minutes. Remove and serve. The end result is nothing but pure comfort, and yes I did crumble goldfish on mine. That’s the type of mood I was in that day, and boy were they ever delicious. Hope you enjoy! 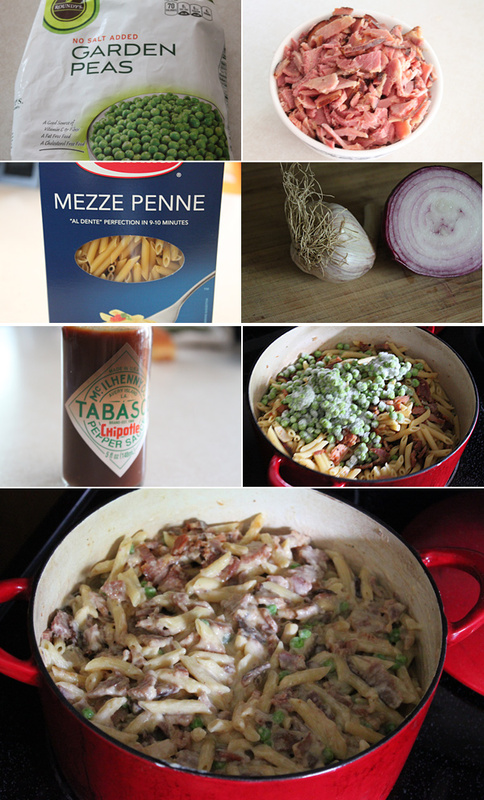 Reminds me a bit of a deliciously simple pasta recipe I acquired from the late Martin Zanine, my parent’s longtime next door neighbor in Ouray, who I knew most of my life. He made a dish he called Fetuccini Della Casa, or pasta of the house. It’s basically Fetuccini Alfredo with English peas and diced ham. He used shaved Parmesan sliced very thinly and fresh minced garlic and dried red pepper. So easy to make and always hits the spot when in the mood for a garlicky creamy sauce.